I was fortunate enough to read The Whisper, Aaron Starmer's sequel to The Riverman, back in January. I was given the ARC because I talked non-stop about its earlier counterpart and once I held the book in my hands, I just about cried. I couldn't wait to dive back into the deliciously disturbing world of Aquavania! Often times, the second book in a trilogy can fall flat from expectation or just poor writing. The Whisper, however, is not one of those books. I found myself trying to savor every last bit and there were so many words and sentences and stories to be devoured within this book that I felt satiated all the way through. The reason why this book works first and foremost is the writing. Starmer writes with a poetic beauty not often seen in children's literature, or rather, any literature as of late. His lines are lyrical and offer up inspiring images that pair well with this notion of change and growing up found in children's and YA literature. Second, this book deviates from the structure of The Riverman in a way that feels fresh, but not foreign. As with Fiona's stories that broke up the first person point of view from the first book, there are other stories of other children and whispers that have occupied the land of Aquavania. There is a shift in point of view from first to third person that offers a tangible distance between the reader and Alistair. His time in Aquavania searching for Fiona changes him and he's no longer that boy from Thessaly that the reader remembers from the first book. And this is great! A character that grows and changes is a character that is real! Alistair is flesh and blood and stories and he offers up all he is to the world of Aquavania in exchange for Fiona. It's a love story unlike any other I've read recently and thus, it made me pay attention. So while some people may feel detached from the characters they loved in the first book, I found the experimental use of story and character to be just what I needed in this sequel. 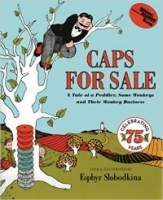 I'm not going to say that all of this book was a warm and fuzzy wandering in a whimsical land of make-believe. This isn't a boy meets girl and they break up type of story. The impending illusion of this Riverman, this Whisper, whom we know, propels the story faster than almost anything else within this book. Because we think we know the Riverman. Alistair thinks he knows the Whisper. But does he? Do we really know everything there is to know about people? This story proves that we don't and shows us just how much a person can be made of: stories and stars and rivers of regret. It's all there. From a storytelling standpoint, this book is flawless. Since engaging in literary analysis is second nature to me now, I can say that this book is a beautiful example of writing. But as a human, as a reader, and bibliophile I can say that this left it's mark on me in an emotional way as well. That's what makes it a fantastic second book. It's success speaks to the quote pictured above, that "sometimes when you take a risk, you fail, but that doesn't mean that you shouldn't be out there trying crazy and difficult things." Maybe for some, this book is a risk that doesn't pay off. But for me, the risks that Starmer took were tactful and terrific and I can't wait to see how he ties up this complicated trilogy. 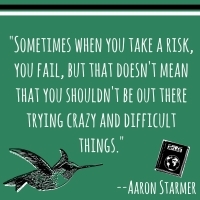 We need more authors like Aaron Starmer to push the boundaries of storytelling. It may only be through words in a book that some of us learn about the possibilities of this world. These books taught me a lesson I'd forgotten; anything is possible! After all this, I'm still left contemplating the notion of fact or fiction. As a true lover of fantasy, I'd like to say that's what this is: a fantastical story based on myth and magic. But to deem this pure fantasy would only cheapen this spectacular story. Starmer's series is more than just fantasy. The facts of this world are embedded into the story and along the way, there are real life images that reflect what is happening to Alistair. Such as the spilled red slushy. It mimics a moment from Aquavania in a terrifyingly true way that made me pay attention to the essence of this story. Because in the end, children are still missing, and Alistair must deal with the consequences of the choices he's made both in the real world and beyond. The stakes are heightened and I was left looking forward to the third installment in this trilogy. In the end, I felt myself unraveling at the prospect of having to leave these characters behind. I think there is something to be said of people that exist only in words on a page becoming real in the minds of readers. It creates a kind of Aquavania that all of us can keep after the story is through. "For forever or until..." I suppose the sentiment is kind of fitting here (and the story behind Starmer's quote is just as endearing as the words sound on the page). For those of you who haven't read The Riverman just yet, fall into this fantastic book today. And for those who have, don't hesitate to find your way back to Aquavania. This book is more than just a whisper. The story, the characters, the words; all the voices are so much stronger than that. To quote this book, "sometimes prayers are answered." And that's how I felt when I finished this! So what are you waiting for? Pick up your copy of Aaron Starmer's The Whisper today!